Betty Germain is married to Dr.
of the Tampa Jewish Federation. served as president of Sisterhood. special services to Senior Citizens. both general and Jewish studies. 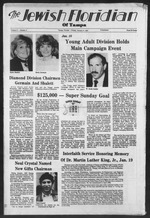 as a vibrant core for Jewish life,"
mitment to the 1987 campaign. no later than Jan. 10. Auditorium from 9 a.m.-9 p.m.
Jan. 19. A reception will follow the service. vision. It is important that the entire community assemble to honor his memory." many of America's highest honors. He was assassinated in April 1968. We wish you well in March, Michael!! bi Richard Birnholz, Leslie Scharf, and Leslie Reicin Stein. more information on this group. rank of fourth in the nation for total financial support of the arts. Wendi and the whole family! delighted to be here, and we're delighted to have them. president of the Jewish Community Center. months of January and February. Party Our Ideas Are Never Ending! $115,000 in pledges was realized. Super Sunday and Super Week. takes just moments to complete. can make a world of difference,"
can manage their own affairs. 97, and most are in their 80s. what they wear more versatile. is appointed to a JASA as a whole. thropies of Greater New York. MAP serves only JASA clients. SHE CITED the case of Mrs.
DON'T PUT THIS CALL ON HOLD. coming to a head as we arrived. term it calculated and methodical. that the gates are closed. say proper Kaddish for the dead. must confess was not an easy one. service which was called for 5 p.m.
of the day for my father. Volume 9 .. N Number 2.
a noted oncologist, Dr. Josef Irlin. tion sorely needed from the West. not available to her in the USSR. least he has a job. liable to become a victim of it. live as a Jew in freedom. board a plane for freedom. by the Vatican in Rome. ween Israel and the Holy See. planned at all at this time,"
Deborah Lynn Adelman and Dr.
gregation Schaarai Zedek on Dec.
Deborah is the daughter of Dr.
Mrs. Dora Hurwitz of Tampa. were attired in royal blue satin. of Phoenix was the ring bearer. all located in the Egyptian capital. descendants of Jacob and Esau." the local JNF office at 8405 N.
East 69th Street, New York, N.Y.
and Fleischmanns Egg Beaters are part ot the recipe. Set aside 1 cup flour In large bowl, mix remaining flour sugar. saN. Fleischmanns gives even meal a holiday flavor. Jointly ipi'ionl by Ih. Ml. Ctvncll >. propriate by Sept. 1, 1986. Exercise (Ages 3 and 4 yean). Goo (Ages 3 and 4 years). ercise (Ages 2 and 3 years). Market (Ages 3 sad 4 years). (Ages 3 and 4 years). ment between mother and infant. a variety of gym activities. Exercise (Ages 3 and 4 years). iog (Ages 3 and 4 years). Eating (Ages 3 and 4 year.). free to call the Teen Director. each of Tampa's Youth groups. Dec. 2nd, 7 p.m., Main Branch. only half day needs, are available. and crafts, Sports and Cooking. embers: Twice a Week, $67.50. free to contact the JCC. ^in the JCC, Boy Scout Troop no. eks in advance of desired date. embers $5 per child plus $20. and cheese social hours and more. will be served. $1 Donation. Don't watch us grow . Become a JCC member now! bombing of Libya and the U.S.
sale of arms to "terrorist" Iran. London, in Rome, in West Berlin. than to a deploring editorial. Craiq A. Newman, D.C., P.A. Mon.-Fri. 8 a.m. to 8 p.m. Sat., Sun. 9 a.m. to 5 p.m.
the Central Synagogue in Rome. he himself is a great teacher. trymen simply didn't care enough. ALTAMURA, MARSH AND ASSOCIATES, INC.
and basks in his "public relations"
the Dream: Let Freedom Ring." Jewish heritage in that country. play on the same team." life and greater future to Spain. spirit and thank you for it. Jewish heritage and its "mind,"
safer and more prudent future. ing with the luxury of modem conveniences. Senator elect Bob Graham on hie recent election to U.S. Senate. has been very much involved with drug prevention and treatment. Hamilton, Grant & Company, Inc. BETWEEN 9 A.M.-7 P.M. MON.THURS. Masters level Degree in Education Required. Experience in Curriculum and Administration. Art Festival Co-chairpersons Ellie Argintar and Sonya Miller. the Temple office at 347-6136.
dars for this multi-media event. chapter 48 of the book of Genesis. the University. Dr. Stephen P.
call Sydelle Berlin at 973-0202.
vice. Then from 5:46 to 6:16 p.m.
ticipate in your spouse's religion? And what do I say to may in-laws? be no right or wrong opinions. ple. Reservations deadline is Jan. Dish Dinner and Wine Tasting. for less than the stores. Evan-Plcone skirts, Kasper, and B. Bennett, etc. Kol Ami Sisterhood Auction 7:30 p.m.
7:30 p.m. Hadassah/Ameet Study Group. In one typical request, Ray E.
Saturday, 9 a.m. Daily morning and evening minyan, 7:30 a.m., 5:46 p.m.
Friday, 8 p.m.: Saturday, 9:30 a.m.
Hauben Services: Friday, 8 p.m.; Saturday, 10 a.m. Daily: Minyan, 7:15. Farber. Services: Friday, 8 p.m.; Saturday, 9:30 a.m.
day of each month, Masonic Community Lodge, 402 W. Waters Ave. (at Ola). P.O. Box 271157. Rabbi Yossie Dubrowski. Executive Director. 963-2317. 13801 N. 37th St No. 1114. Rabbi Dovid Modrin, Program Coordinator. 971-6234. BNAI BRITH HILLEL FOUNDATION at U.8.F./U.T./H.C.C. evening 7 p.m. Sunday Bagel Brunches, 11:30 a.m.
study discuason aeseioni, "Shabbat Experience," monthly services and dinner. WHO SHALL LEAD US & WHY? Milton Stein of Sarasota, and Mr.
Brian Seth Neuman, son of Mr.
"What Freedom Means To Me,"
highest tribute, the "Tree of Life" Award. TO SERVING YOUR EVERY NEED.